The Shelti 315 is a quality table that features a marble-like cabinet design that is comparable to the look of the Tornado Storm II foosball table. Set up like most American style tables, it offers a flat playing surface with a 3 man goalie. The side ball return offers a convenient feature if you are big on practicing foosball solo and it also allows you to save space by positioning the foosball table closer to the wall. 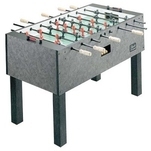 This foosball table is priced at around $800 US.